Are movies in 2019 heading for the metaphoric and the allegorical? You’d think so after seeing Jordan Peele’s “Us,” which throws symbols at us so fast that we’re glad the film is not in 3D. Where his “Get Out!” was about racism and the white liberals’ hypocrisy, “Us” is about the whole America, which Peele divides into the rich and powerful and the underclass that serves it. “Fast Color” is at base a sci-fi thriller with a few mild aspects of horror, its domestic scene serving largely to make us more aware of the need for men to crush feminism, but it is also about a helicopter parent who smothers her daughter to such an extent that she becomes rebellious and moves away for a long time. Still, it can be enjoyed even by folks who don’t give much of a fig (to coin a metaphor) for symbols, since it shows domestic scenes to which some of us can relate. And for those who like computer graphics/visual effects, director Julia Hart has her abundant visual effects team throw in some bright color, albeit not of the fast kind. Julia Hart, whose “Miss Stevens” tracks a teacher who shepherds a group to a drama competition (to which I can relate since I arranged similar activities for my high school students), and the upcoming “Stargirl,” about a homeschooled teen who shakes this up in an Arizona high school, may not be dealing with high-school kids in “Fast Color” but her interest remains with young women. The primary focus, and that of her real-life husband Jordan Horowitz who serves as co-writer, is on Ruth (Gugu Mbatha-Raw), a confused woman in her early thirties who is on the run. Formerly a drug addict, she for the past eight years of so has left her daughter Lila (Saniyya Sidney) in the care of Ruth’s mother Bo (Lorraine Toussaint). Without the help of her mother, she is on the run from the government in a dystopian America that has not seen rain for a long time, conjuring up John Steinbeck’s “The Grapes of Wrath,” if you will. She has a special power that makes a pursuing government out to haul her in to study her since when she has a seizure, the earth shakes and pictures fall from the wall of her solitary New Mexico town where Bo and Bo’s granddaughter are living. In particular Bill (Christopher Denham), a scientist who will advise Ruth to stop running because she is “hurting people,” has been trying to track her down. This power has been handed down through the generations, though Bo, who does not get seizures, has a hobby of breaking up objects into molecules and putting them together, shown as she whips her cigarette into its toxic parts and puts it together. Much of the action is like the CGI; on a low key until the final minutes when the sky bursts into colors, the family’s principal trick consisting of taking the sky apart and putting it together into its current, bland blue color. Ultimately Sheriff Ellis (David Strathairn) hopes to track the runaway down, while we in the audience get the story’s principal twist. Yes, there’s something about this fellow that makes him more than just the enforcer of laws, a guy who has no intention of locking up his prey. Gugu Mbatha-Raw has entertained audiences in “A Wrinkle in Time,” another imaginative tale involving a father’s disappearance in space and the team sent to find him, but you’re probably wondering about her name. Her father, Patrick Mbatha is a Black South African doctor, and her mother Anne Raw, a Caucasian English nurse. The British-born actress delivers nicely, whether causing earthquakes all around her during her seizures, breaking free of the ropes that bind her, or checking into a fleabag motel that charges as much for a huge jug of water as it does for the room, though despite her special powers she is vulnerable almost throughout. The problem with “Fast Color” is that the story is not solid enough to convince the audience that it serves the transcendent purpose of seeing it as a feminist allegory of three women (yes, even young Lila can make a bowl rise from the table and disappear into a collage of colorful dots) being chased by men who, if they could, deprive the trio of their powers. Nor are we convinced that the behavior of Ruth’s mother, Bo, caused Ruth to disappear from a forlorn home and desert her own daughter for eight years. In short, the tale could have used more flashes of melodrama. 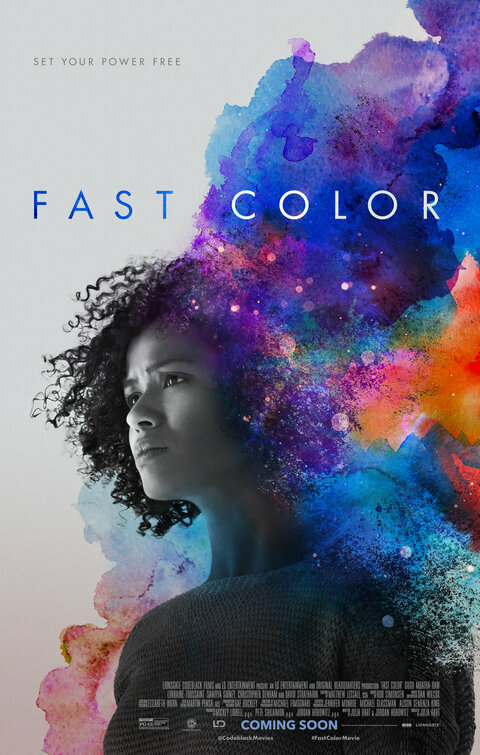 “Fast Color” was filmed by Michael Fimognari exclusively in New Mexico.